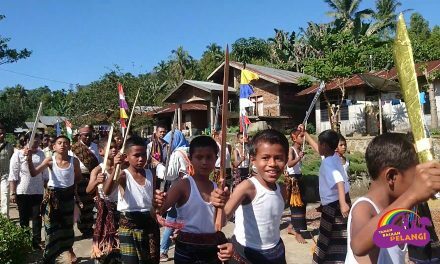 It has been a while since my first Volunteer Diary, so here is an update straight from the mountains of Flores. To begin with, I’m really getting used to the simple life in Roe. Moreover, I enjoy this experience and how the days go by. A typical day includes teaching in the school, activities with the kids in the library and sports. I do sports by myself but also play soccer, badminton or volleyball with the kids in the breaks during school or if there is time in the evening. Of course, this does not affect the activities in the library which are now regularly and usually every day. 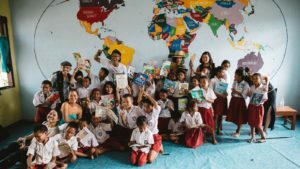 It is simply amazing to see the kids’ excitement to read and there are many children who are in the library whenever they can. That is also fascinating since most of them have to work at home and do chores like cleaning, helping their parents on their fields or pick wood from the forest, if there hadn’t been any rain that day. 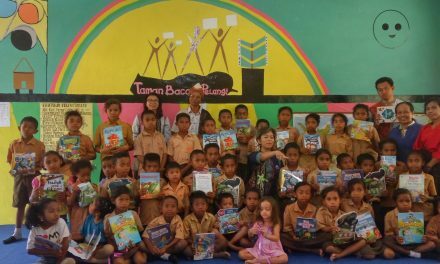 To put it in a nutshell, they spent all their free time at Taman Bacaan Pelangi to read books. They really love to read and they often do not want to stop even when I offer art & craft activities or stuff like that. Actually, every day with the kids is fun and their enthusiasm and their happiness also affects me in a very positive way. The highlight of this happiness and a day full of fun was the birthday party on December 6. TBP in Roe is now running for five years, so I organized a little party with the kids to celebrate this anniversary. 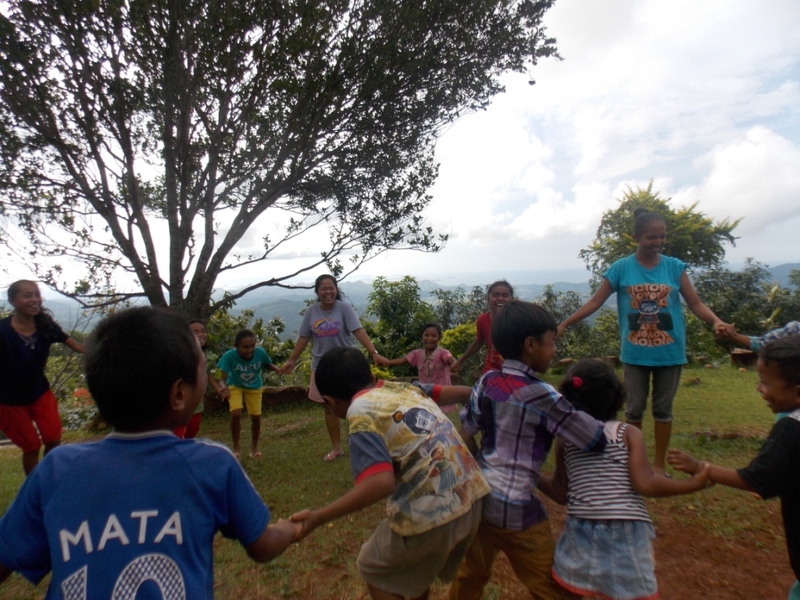 We started after the school with games, quizzes and also singing and dancing performances from the children. The kids were excited to do such a performance, and even created a special song for this event. 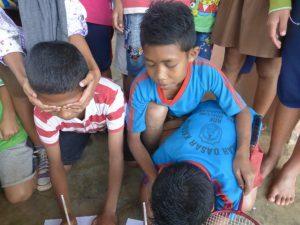 The games like drawing with blind eyes, a spelling contest, a quiz about the library and many more were so much fun and the kids and I enjoyed every minute. The only negative thing was the heavy and long lasting rain. Due to that, we had to improvise a little bit, but that was no real problem. 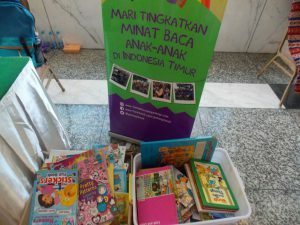 At the end of the day every child received a small gift, for instance colour pencils or playing cards. Because the kids do not have paper or a drawing book, we will make some of our own and also learn about new games using the playing cards. Even on this day with many games and activities, I still found not just a couple of kids still reading books. 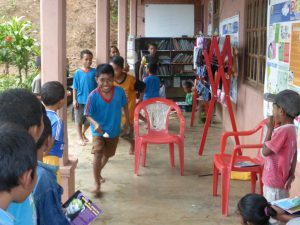 The only time they are not reading in the library is when it is raining, since they simply cannot come to the library. This regular and heavy rain every day is completely new to me and I am not really getting used to it. Of course, there is also rain in Germany, but not like the rain in Indonesia. 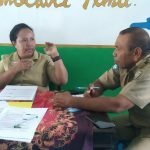 The only positive aspect for me is the huge number of different fruits which has increased due to the rain season, but I’m also aware of the importance of the rain here, especially because most of the villagers are farmers and their situation depends on the condition of their fields and the upcoming harvest. Beside the activities in the library, my English lessons in the school made a first real impact. 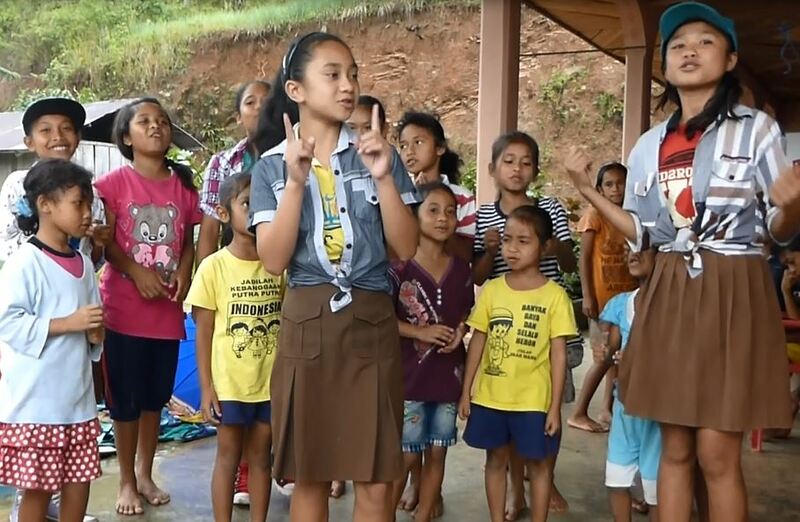 In the last week, the “Ujian Semester” took place at the elementary school in Roe and English was a part of this for grade five and six. Not only that it was a part of it, the students were really successful in those tests and I am really proud of their results and their progress. As you can see I am really busy here and there is still a lot to do before Christmas.